It’s always hard to tell what’s impressive circus. I can’t even do a forward roll so seeing someone do a handstand is impressive to me. Even if tricks are good it can be hard to immerse yourself as you become immune to the spectacle. Gravity & Other Myths’ show A Simple Space is different. There’s no pretence or element of ‘showbiz’. Instead, the performers wear plain, neutral clothing on a raised platform with a stack of spotlights in each corner of the stage. The aesthetics are bare, but the performers make up for it with their personality. They have charm by the bucketload. There’s a real element of play in A Simple Space. At the top of the show, members of the cast shout ‘falling!’ as they lean back, hoping someone will catch them. An extreme trust exercise when the speed ramps up, there are a couple of near-misses. These games are interspersed throughout the show, including a skipping competition between three men (each trip cost you an item of clothing), and two male audience members are brought on stage to be held up by the smallest females of the group in a strongman contest. There’s even a moment when drummer Alex Flood takes centre stage and plays percussion with his body, slapping his stomach, face, and thighs. It might not be a headstand, but his body has certainly been pushed to a different limit; his skin is red raw. The cheekiness of the group lights up the tent, and the stunts seem more daring because of it. And they are. Performers are used as skipping ropes, bent backwards and hurled around. They climb and balance on each other’s heads and jump across each other’s backs. It’s both beautiful and hard to look at – you’re always wondering if there will be a miss or someone might not get caught. But really you know you’re in safe hands. It’s pretty incredible what bodies can do. 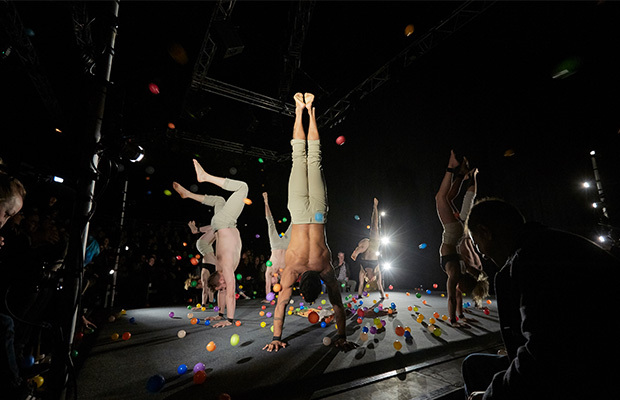 Towards the end of the show, we are given balls to throw at the performers, aiming to knock them out of their handstands. It’s one of the most playful experiences I’ve had watching a show, and the simple lighting highlights the rainbow sea engulfing the stage. 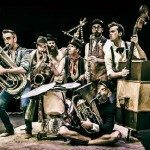 A Simple Space is a tightly choreographed, and playful acrobatics show filled with laughter and impressive stunts. It’s the best circus show I have ever seen.